Serena Williams' row with umpire Carlos Ramos overshadowed Naomi Osaka's incredible US Open success on Saturday. Yet it is not the first time the American great has found herself involved in controversy at her home grand slam in New York. Williams has argued with umpires on multiple occasions and once threatened a line judge. We take a look back at some of her US Open rows. Williams had reason to be aggrieved during her meeting with Capriati in 2004, when she kept her cool more effectively than others may have done. Multiple line calls – almost all incorrect – went against Williams during the encounter. After one backhand down-the-line winner during the second set was overruled by chair umpire Mariana Alves, a stunned Williams asked: "What happened? That's my point. That ball was in. It's my advantage." It was one of several bad calls that went against Williams, who later received an apology. The encounter would be remembered as one that led to the introduction of Hawk-Eye. Williams' loss to Kim Clijsters in the semi-finals nine years ago featured arguably the biggest controversy of her career and one of her major outbursts. Called for a foot fault while serving to stay in the match, Williams blasted the line judge, allegedly saying she would shove a ball down her throat. Williams received a point penalty at match point down, handing Clijsters a 6-4 7-5 victory. Williams was later finished $175,000. 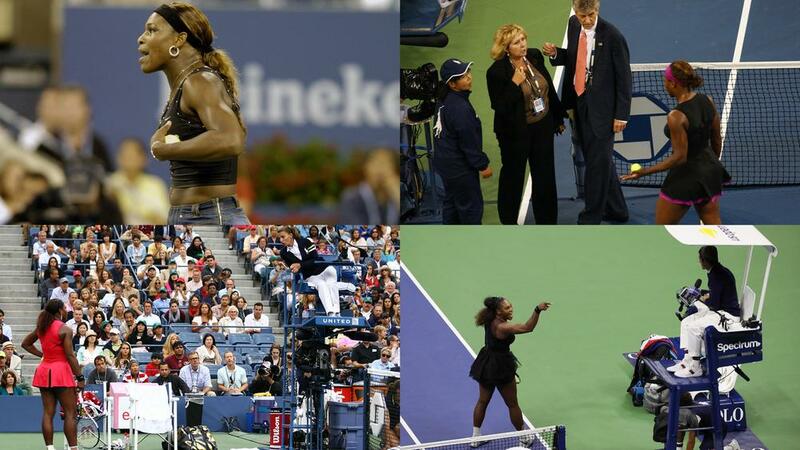 Williams' previous loss in a US Open final came seven years ago, and it also included plenty of controversy and an umpire row. Williams screamed in celebration after hitting a powerful forehand in the first game of the second set against Sam Stosur, but well before the Australian had a chance to return the groundstroke. Umpire Eva Asderaki called 'hindrance', handing Stosur the point and break of serve. "Aren't you the one who screwed me over last time? Are you coming after me? That is totally not cool," Williams said to Asderaki. At the next change of ends, Williams continued to rant: "Don't even look at me, You're a hater. You're very unattractive inside. I never complain. Who would do such a thing? You're punishing me for expressing my emotion." Williams refused to shake Asderaki's hand after Stosur's 6-2 6-3 win. Williams was involved in an incredible row with Ramos during her 6-2 6-4 loss to Osaka, who made history as the first Japanese player to win a grand slam singles title. Williams was handed three code violations, culminating in a game penalty late in the clash. The first came for coaching before Williams – chasing a record-equalling 24th grand slam singles title – was given a second for racquet abuse. As she argued with Ramos, she received a third for verbal abuse, having labelled the umpire a "thief". Williams claimed to be unfairly treated as the row overshadowed an incredible achievement by 20-year-old Osaka.